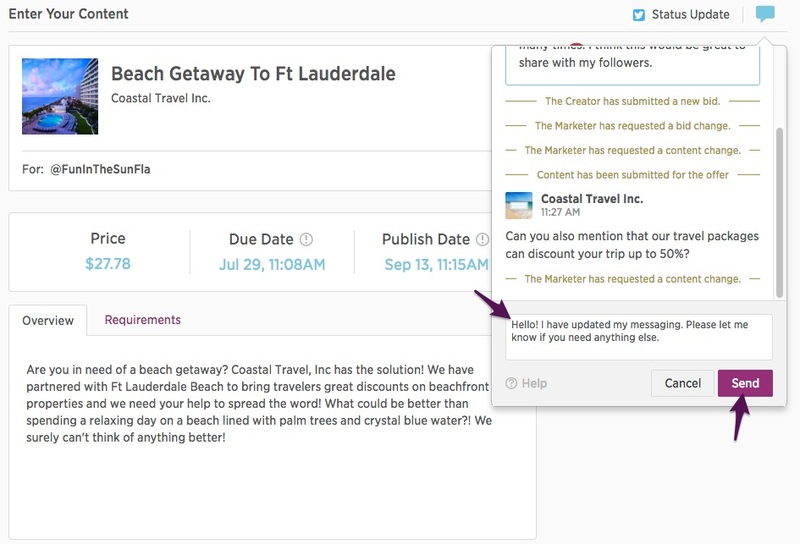 With the Offer Chat feature, Creators and Marketers can communicate seamlessly with one simple click. This article with walk you through revising your content while responding to an Offer Chat. 1. If the Marketer has requested a revision for your content it will appear in the Actions Required tab under Negotiate. Click on Revise to view your content and the requested changes. 2. From here you will be taken to the Content Creation page where will be able to view your original content. You will also notice the change request provided by the Marketer in the upper right-hand corner. 3. You will also now be able to view any chats from the Marketer which are represented by a number in the chat icon. Click on the Offer Chat box in the upper right-hand corner of your page. 4. This Marketer has requested you provide more information about their travel discounts. 5. From here make any changes necessary to your content. 6. Once you have made your changes, respond to the chat by simply clicking on the chat icon and then typing your message in the box provided. Don't forget to hit Send. 7. After you have successfully sent your chat, simply click Cancel to close the Offer Chat box. 8. Now that you have edited your content, you will need to send it back to the Marketer for review. Click the Submit button to send your revised content.